Sold by HomeN'Stars and ships from Amazon Fulfillment. Sold by Rabbitgoo and ships from Amazon Fulfillment. 5.0 out of 5 starsWork great if you store them correctly between usage. 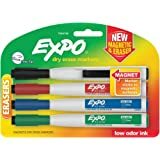 These markers work great for the small metal dry-erase board we have attached to our fridge. Do NOT store them tip facing up vertically with magnet at the top. If you do this the colour will quickly get weak and you'll think they've dried up, but they haven't, the ink has just run into the pen due to gravity. Store these pens vertically with the tip down (the magnet is easily strong enough on my metal board) and they'll be strong, consistent colours, and work well every time. Be aware that depending on how they were stored at the warehouse and in transit there is a chance that they may not write correctly when you first take them out of the pack. If you're having issues I suggest you store them tip-down for a day or so and then try again. 5.0 out of 5 starsGreat markers for boards. I got these markers because obviously I ran out. I was skeptic when I was thinking about purchasing them because I read send me views that said they weren't good enough. Either way, there were more good reviews then bad reviews so I decided to purchase them. I'm glad I did because I absolutely love them. Their ink is not faded and it write pretty fine when though it's tip size is medium. I absolutely love them! By the way, it does not come with the board. These have a very vibrant color to them. After not using these for a while, and then trying to use them again, I ran into the problem of them being too light to use. I tried them all and none of them were dark enough except for one, which happened to be facing down. After facing the rest of them down, a day later I tried them all and their color was back good as new. Since then they've lasted me a long time and still look extremely vibrant and saturated. Just make sure you leave them upside down. 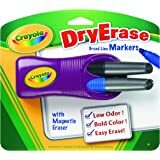 5.0 out of 5 starsThese will be my go-to dry erace markers from now on! 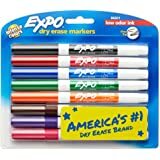 We homeschool my son and so we go through a lot of dry erase markers. 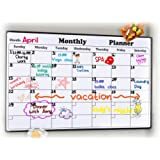 I was looking for a marker that would hang on the board with the magnet but also just right well and erase easily. 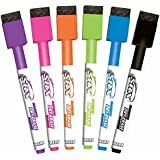 Let me tell you we have gone through a lot of different brands of dry erase markers! Both my son and I love these ones. They do write very clear and are easy to erase. 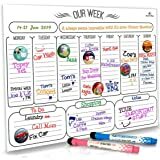 I'm so glad to have finally found A dry erase that does not require a ton of elbow grease to get all the marks off! I've been using them every day for about two weeks now and so far none of them have dried up. I'm really impressed with these things. Oh and also they don't stink! I have a very sensitive nose and I love the fact that My sniffer is not attacked every time I open these. 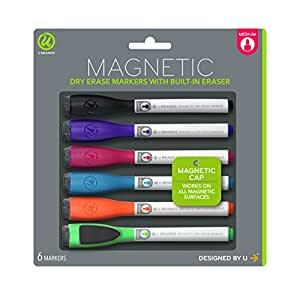 We don't use the erasers on the caps because we have a large eraser, but I think if that's the only eracer you had you'd get tired of erasing pretty darn quickly. Seriously that's the ONLY negative I can think of. Everything else is five stars. Anyway hope this helps! Please free to ask any questions if you need more info. Colors aren't very vibrant. I've used the orange marker once, just to test it. It doesn't even work now at all, even though I've stored all of the markers with the ink tip facing down. All of the colors stain my white board, which is a permanent fixture in my cubicle in a new office building. Erasers on the caps don't work very well and I have to use tissues to get what's remaining. My advice is to spend a little more to get a quality product. I wish hadn't bought these, and still had a stain-free board.